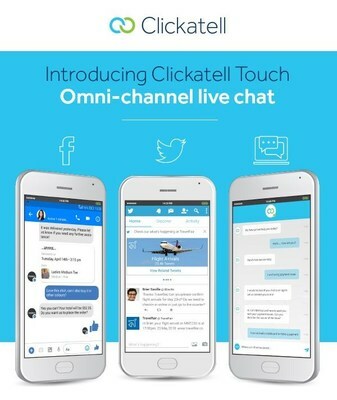 Clickatell Touch enables live chat across a company's website as well as social platforms (Twitter and Facebook) and mobile apps, bringing customer care and engagement into a single business platform. "Today's consumers expect to engage with your brand on the digital channel of their choosing. They want to message your business and instantly have queries resolved, find the information and services they are looking for, without the need for a voice call. Clickatell's Touch makes that happen with the right level of capabilities for businesses of all sizes," explains Deon van Heerden, Clickatell Engage CEO and Group CFO. Businesses can start using Touch Go immediately, with a free Starter option. Touch Go requires no credit card for sign-up and is fully featured with a simple setup process. It offers customizable branding, a unified chat desk business application as well as reports and analytics. As the business scales up its digital customer care, it can opt-in for the Touch Enterprise offering. Touch Enterprise is designed for scaling up customer care efforts through advanced capabilities including AI driven virtual agents, sentiment analysis, automated workflows, enterprise integrations and in-channel mini-applications. "Customer care has become a defining factor for sustained business success. In an ever-increasing mobile native world, customers often choose to interact digitally, but they also expect to be able to reach a human immediately, should they need. Monitoring multiple channels and providing immediate action becomes challenging with siloed deployments. Touch's unified solution allows businesses of all sizes to provide the customer delight in a simple modular approach," says Nirmal Nair, Clickatell Engage EVP Product & Marketing. Businesses interested in Touch can begin immediately by signing up on the Clickatell website.